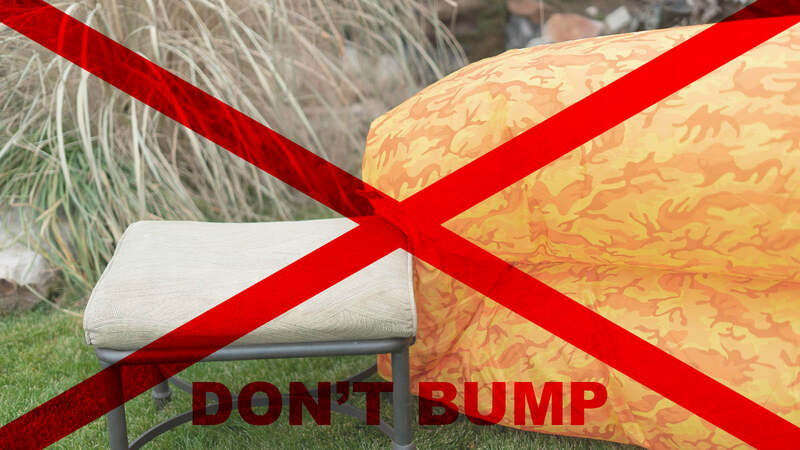 You may have seen people running through the park or at a festival, attempting to inflate their loungers, having limited or no success in filling them. Or perhaps you’ve heard that it takes a stiff wind to fully inflate an Airlounj. The fact is, neither running around or wind are necessary to inflate an Airlounj. On the contrary, once you grasp our technique, it takes less than a minute to fully inflate and begin lounjin’! 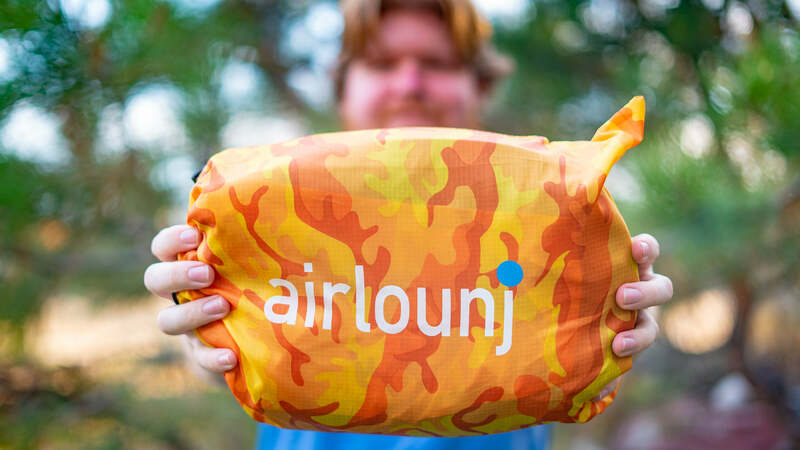 We at Airlounj have enjoyed demonstrating and teaching literally thousands of folks in the Airlounj community just how easily it can be inflated. No need to run around or stand in the blowing wind! As we’ll explain, just a simple pulling and pushing/sliding motion will quickly inflate your Airlounj. Your Airlounj has been constructed using a super strong, durable, yet lightweight, 210T rip-stop nylon for it’s outer layer. This layer has been designed to protect the inner poly bag. The poly bag forms a single chamber that holds the air. Although there are two openings used to fill the chamber, once captured, the air flows between either side and in the pillow/head rest space. This equalizing ensures that both sides of the Airlounj are the same height and firmness. As you become proficient at inflation, you may discover subtleties and tweaks to our technique which work better for you. Great! We just want you to get off to a good start and keep you away from inflation temptations like running, leaf blowers, fans or waiting for hurricane-like winds. After removing your Airlounj from it’s carrying bag, unroll and lie it flat on its side (with the Airlounj logo up). It doesn’t matter which side is on top. Again, there is a single chamber, so air will flow to either side during inflation and use. Now grasp the open ends of the Airlounj. You’ll feel that there are four plastic ribs sewn into the ends. These are used to wrap the material around and ensure a good seal is formed after inflation. You’ll also see there are two openings to the chamber. We’ll refer to them as upper and lower (whichever is on top is upper and bottom is lower). The space in between doesn’t hold air and is just where the center seam is sewn together. Stand with your feet about shoulder space apart and shoulders parallel to the side of the Airlounj. Next, holding the ribs for the upper chamber, place the Airlounj so you are reaching back for it, with your arms extended. Remember, you’ll need enough distance to pull the Airlounj toward you to capture the air. Opening only the upper portion of the chamber as you slowly pull the Airlounj toward you, scoop air into the chamber. HELPFUL HINT: The wider you make the opening, the greater volume of air will flow into the chamber. The pulling motion itself is relatively short, a few feet at most. In fact, it’s best not to pull the Airlounj past your body. 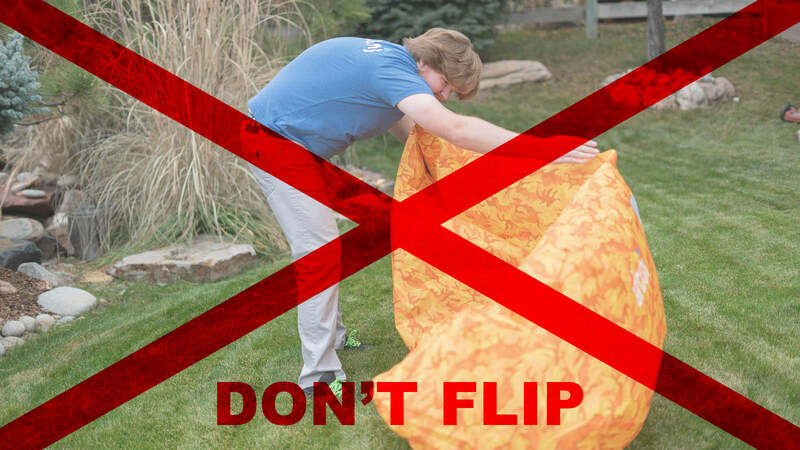 Also avoid any twisting or bringing the Airlounj above your head. IMPORTANT: As soon as you stop the forward motion, remember to close the chamber opening. (This prevents the captured air from escaping.) After scooping air into the chamber, be sure to keep the Airlounj straight as you slide it away from you and repeat the same movements. HELPFUL HINT: Avoid letting the Airlounj bump into anything during inflation, as this will push air out of the chamber....... which you don’t want. Continue the pull and slide motion until the upper section of the chamber is about 3/4 full with air. Don’t count how many times..... just concentrate on your technique. It’ll all come together. This time, while keeping the upper channel ribs closed, prepare to open the lower side of the chamber. HELPFUL HINT: We’ve found it best NOT to rotate or flip the Airlounj during inflation (so leave the channels in their same upper and lower position). Now repeat the sliding and pulling motions with the lower chamber until it also is about 3/4 full. Once both sides of the Airlounj are inflated, roll the end with the plastic rips tightly together, overhand, and away from you. Keep the material arount the ribs smooth, without letting it bunch up. HELPFUL HINT: The tighter the roll of ribs/material, the better the seal and longer your Airlounj will stay inflated. As you roll the ribs, the air inside the chamber is being compressed, resulting in the desired firmness of your Airlounj. Once you’ve determined the Airlounj is at a comfortable firmness, gently bend the ribs downward (forming a U shape) and snap the buckle together. That’s it. You and Airlounj are now ready for some serious lounjin’! You’re now ready to experience the extreme comfort of Airlounj. Where ever life’s journey takes you.... remember, it’s always better with Airlounj. Stowing Airlounj in it’s carrying bag is another awesome feature and it’s easy to get your Airlounj back into it. To deflate your Airlounj, turn it on its side, hold both sides of the ribs and unsnap the buckle. Then simply open the chambers and allow the air to escape from each side. When most of the air has escaped, lay the Airlounj back on its side. Next, begin tightly rolling the Airlounj from the pillow end (like you would a sleeping bag or tent). This will push the remaining air out of the chamber. 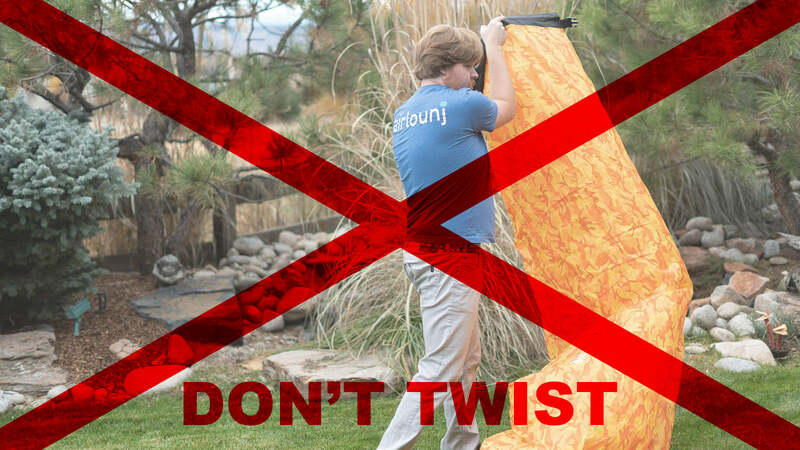 HELPFUL HINT: The tighter you roll the material, the easier Airlounj will slide back into it’s carrying bag. Roll the Airlounj until reaching the rib end openings. You’ll now have a roll of material that’s about four or five inches in diameter. Gently bend the roll in half, forming a U shape and snap the buckle together. Place Airlounj in the carrying bag by first inserting the curved end, then sliding it the bag. HELPFUL HINT: Remember that the Airlounj carrying bag is not a stuff sack. 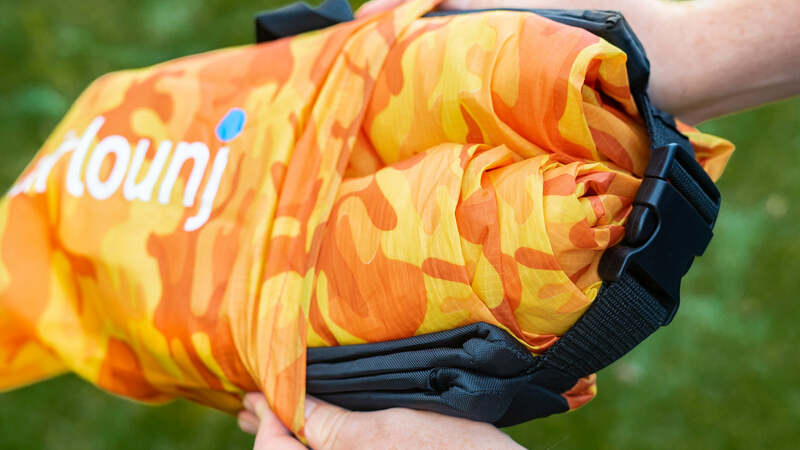 We’ve found that tightly rolling the Airlounj as described is literally the only way to easily get Airlounj back in the carrying bag.... folding doesn’t work.